Today we commemorate the 100th anniversary of the Triangle Shirtwaist Factory Fire. The fire claimed the lives of 146 workers in New York, mostly young female immigrants from Europe working long hours for low wages, who died because of inadequate safety precautions and lack of fire escapes. This sad event helped to galvanize a movement for social justice, immigrant rights, industry safety and fair labor practices. Fire safety, in the home and workplace, remains vital. I’ve been proud to work for a safer world during most of my career along with leading standards development organizations like the National Fire Protection Association and Underwriters Laboratories Inc. Both of these organizations were founded in the mid-1890’s and learned from this fire. Working to develop and evolve voluntary standards with entire safety community, including manufacturers, trade associations and the local, federal and state governments, we can thank them for the very high standard of safety we enjoy in the workplace and for continuing to evolve the standards. 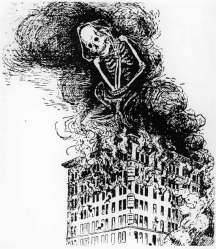 Those who died tragically in the Triangle Shirtwaist Factory Fire did not die in vain.